You may have been to the Park Centre building on Park Street to dine at Barbeque Nation or to shop at Tantuja. If you had looked around a little more, you'd have definitely come across the most gorgeous white gown on a mannequin that looks out from a tiny shop window. It's not a sprawling design den with plush interiors and multiple trial rooms. In fact, it couldn't even be much bigger than a large closet. But what's inside will surely make you catch your breath. Done up in satin and lace curtains with pretty flowers scattered around, SJ's Bridal Boutique has the most gorgeous white gowns hanging from the racks. Set up by designer Kareen Veronica, the boutique has gowns made in tulle, satin, silk and georgette, with intricate detailing and seriously stunning trains. There's no reason to be jealous of Andie McDowell any more (remember her in that dress in Four Weddings And A Funeral?) because Kareen will help you get a near-perfect lookalike of those standout gowns that you saw in iconic Hollywood films. 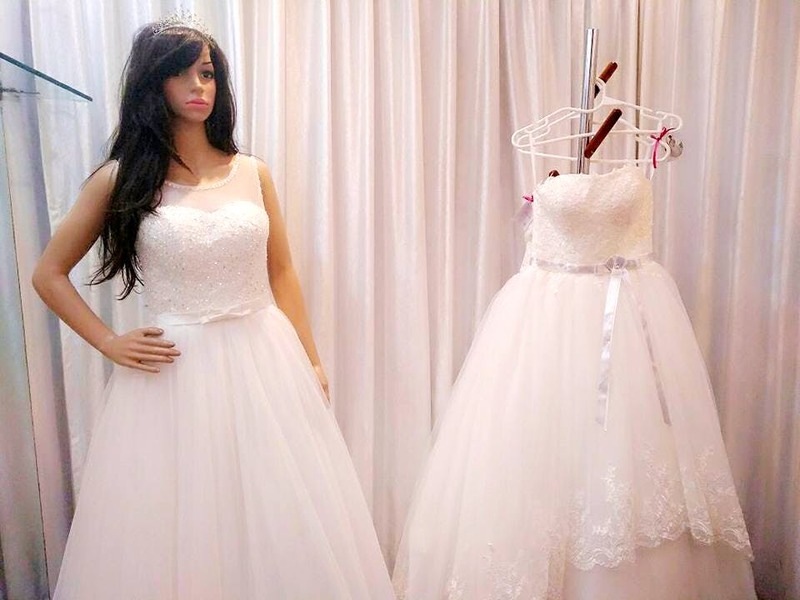 They can customise the gowns to your size and style preference (when in doubt Kareen will also help you choose the sweetheart neckline or the pearl detailed bodice). Ball gowns or ones for a wedding, we found all kinds here. Everything was in white or pale whites. All laced up with tulle, each of these gowns come with a bespoke corset with hand embroidered details. And for your ball gown, they'll give extra cancans complimentary with your dress. You'll also find the prettiest veils to go with the gowns. And if you want to give the real flowers a miss and have your wedding bouquet as a keepsake, then just let Kareen know. She'll make yours with pearls, and paper flowers in pretty pinks and pastels. Prices of the gowns start at INR 10,000. The bouquets and other accessories start at INR 2,000. The boutique is really small, and has no room for trying the dresses. Want to be the queen on your wedding day, but still haven't found a suitable tiara to match your style? Tell Kareen about it, she'll make one for you.